These dogs have large rounded ears, a black muzzle, long legs, and broad bushy white tipped tails about 30-41cm long. The colour and pattern of the coat is dramatic and varied. 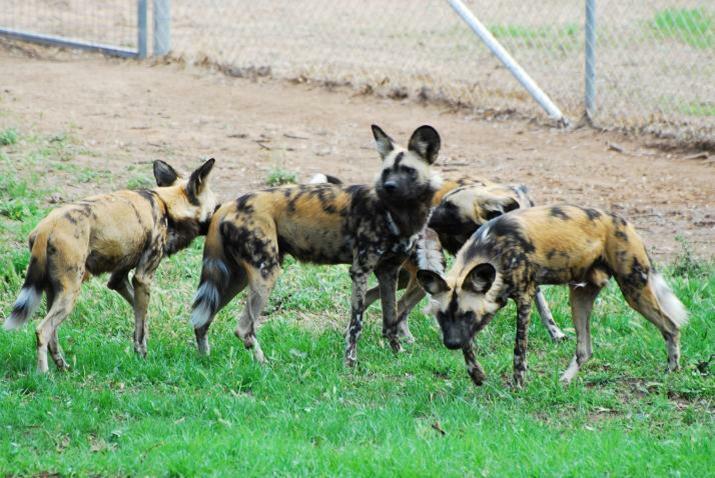 Each dog has a unique pattern of yellow, brown, black, white and gray splotches over its entire body. The dogs stand 61- 78cm at the shoulder, with a head and body length of 76-112cm and weigh from 17-36kgs. African Wild Dogs differ from wolves and other dogs in that they have 4 toes instead of 5. The Scientific name of Lycaon pictus, means Painted Wolf. The hunting success rate is extremely high at 70 -90% compared to other carnivores that have an average of under 50%. The hoot of a lost African wild dog can be heard by humans from as far away as 4kms. All pack members contribute to feeding and protection of the young. Once pups accompany adults on the hunt they are given first rights to the feed. The adults wait for the pups to have their fill before feeding themselves. Each dog has a unique coat pattern much like a finger print in humans. Diet: African Wild Dogs are carnivores and hunt antelope, zebras, wildebeest, impala and at times even ostrich and warthogs. Group Structure: Wild Dogs are very social, hunting together. They live in small packs of between 6-20+ individuals. They are led by an alpha male and female and only this alpha pair normally breeds. Reproduction: Breeding occurs once a year with the alpha female having a gestation period of 69-73 days and then giving birth to anywhere between 2 to 20 pups. Lifespan: 10 – 15 years.